Yay! It’s before and after bathroom day! If you need a little refresher on the story of our master bathroom so far, you can get all caught up on the beginning phases of the renovation here. So, let’s do this! Let’s look at just how bad this room really was! …OK. Here we go. I can’t believe I’m actually even going to show you these! 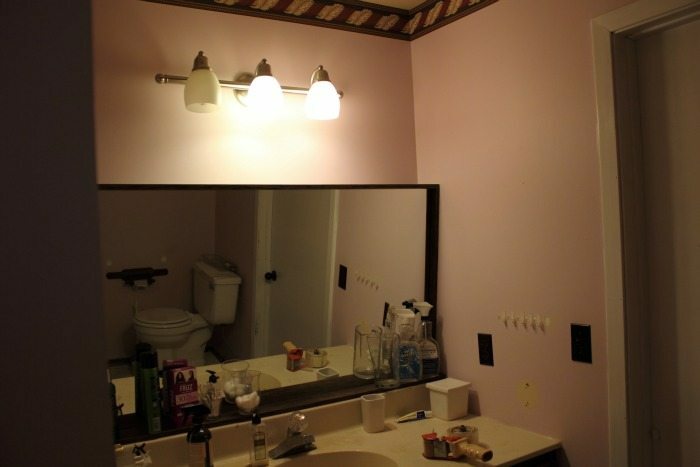 Keep in mind that this is after the bathroom had been completely abandoned for a few months.. so it’s a disaster! We basically just left our stuff in there, closed the door, and started using the other bathroom. We took these pictures the day before we started ripping everything out. 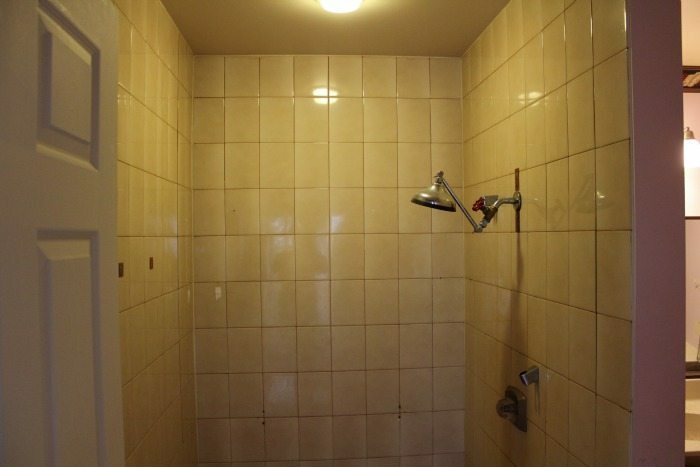 We had this dark cave of a shower, which was a good size, but pretty much just gross and uncleanable. This part of the house had been made wheelchair-accessible at one point so the toilet was on a little pedestal, which was a pretty entertaining conversation starter if anyone ever happened to see it when we were showing them around. But still, gross. Bad news. …And this was the vanity area. Disaster. I really don’t miss the pink paint with the maroon wallpaper border, believe it or not! OK. Now that that’s out of the way, on to the fun stuff! Here’s the bathroom now! What?? Is that even the same room? We moved the door so you now enter in from the back hallway in our master bedroom instead of right across from the bed and added a waaay bigger window too. Then, of course we ripped out every inch of wall and floor in here and completely rebuilt them. You can see more of the gory details from when the room was completely gutted in this room here. Then we moved the plumbing for the toilet and the tub, installed heated flooring, and next we were on to the fun stuff! One of the main focal points in this room is obviously the amazing vanity, which I was extra-super-duper lucky to have provided to me by KraftMaid. It’s just full of amazing storage solutions too, which you can read more about here. Side note: I meant to put a fresh roll of toilet paper on the paper holder so it would look nice for the pictures but clearly I forgot! It’s a really nice toilet paper holder though, isn’t it? Actually, the toilet paper holder, along with all the other pretty shiny things in the room like the faucets, light fixtures, and drawer pulls were all provided by Moen. You can see more details about them in this post here from a few weeks ago. I definitely love my pretty shiny things! Even better when they actually serve a purpose! You can see we used a lot of really beautiful tile in the room too. Actually, I may have gone a little overboard on the tile when I was designing this room. I was a little bit like a kid in a candy store! We started out by choosing a shiny white subway tile to go all around the room, halfway up the wall. We used the beveled version so it would have more of a historical feel and fit in with our old farmhouse. On top of that we ran a little strip of marble mosaic tiles in a brick pattern and topped it off with a chair rail, also made out of tile. I also got pretty excited about the whole marble thing and decided that the whole wall behind the vanity would be amazing if we did a marble mosaic in a herringbone pattern. Well, that sounds easy enough until you get to the edges and realize that you need to figure out a way to cut each individual teeny tiny tile into a little mini 1/4 inch triangle with the tile saw. I’m just lucky that Chris specializes in ridiculously meticulous tasks like that!… and about 20 straight work hours later, we had a tiled wall! The first thing you see when you walk into our washroom is the toilet, now that we’ve moved the plumbing around. Supposedly, you’re not supposed to make the toilet the first thing visible, but I think I just consider it convenient, really. Plus it really is a huge improvement on the previous view from this location. Truth-be-told, I’m pretty excited about the new toilet. It’s a lot more modern-looking than all of the other fixtures in the room but I think it’s a pretty brilliant design. The trap at the base of the toilet is actually hidden so the sides are all just straight up-and-down all the way around. Nowhere for tiny piles of cat fur and dust to rest that need constant wiping! It makes a difference! 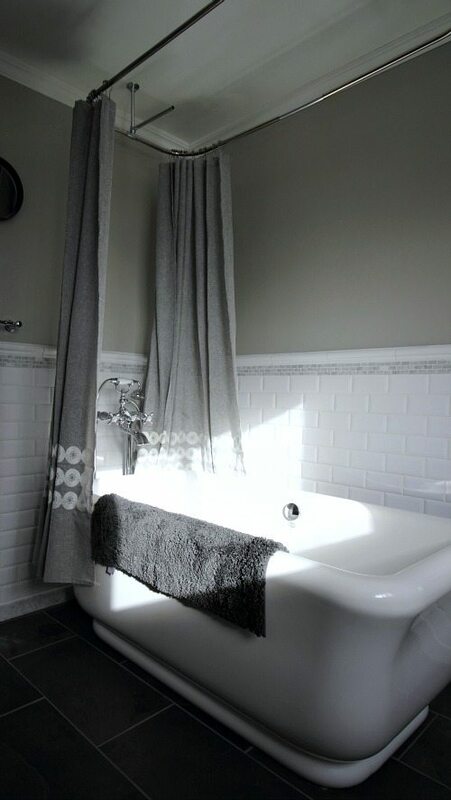 The free-standing tub is also obviously a main attraction in the room and it was designed really cleverly too! It’s actually a small tub, but it feels huge because of how deep it is as well as the square shape inside and out. We decided to go with a 5-foot tub rather than a 6-foot one to keep the room feeling spacious and I’m so glad we did! I love that this room is super fancy (by my standards at least!) and traditional in style, but it still feels fresh and approachable and totally like “us”. I always think you know you’ve done a really good job designing a room when it becomes really easy to decorate it and make it look good, almost no matter what you try. Even, a plastic walrus! So that’s the bathroom! If you can’t already tell, I’m thrilled with how well this giant project turned out for us. I hope you enjoyed your little tour! A big huge ginormous thank you again to Moen and KraftMaid for providing so many amazing and important products for this room. They really made my whole vision come to life and it would not have been the same room at all without their generous contributions!! Just beautiful! Y’all did a fantastic job! We just completed a master bath/closet remodel that included moving wall, doorways, windows and plumbing lines so I KNOW just how much work went into your remodel! Love your tub….we almost went with that one but I’ve always loved a clawfoot tub so I didn’t second guess myself and got the clawfoot. Love it. We also used the same subway tile you guys did. Isn’t it beautifully white, shiny and clean looking? Hope you”re loving your beautiful new space as much as we’re loving ours! It sounds to me like you’ve got some impeccable taste there! 🙂 I originally wanted to do a clawfoot too, but this tub spoke to me so I went for it! I love the claw foot tub. Where can one get one for a decent price? Hi Liz! My tub doesn’t actually have any feet, it’s just a free-standing one that sits right on the floor. I think the current price of ours is around $2000, so it’s definitely not the lowest price out there, but I’ve seen a lot of claw foot and free-standing tubs at all different price points. I’d suggest starting out by searching the website of your favorite big box hardware store like Home Depot. They always have so many options that you didn’t realize they had online! Wow! your bathroom is gorgeous! I love transformations like this, thanks for sharing. Thanks so much! I love dramatics transformations too, so I’m glad mine was fun for you! Looks so nice! Great job on everything! May I ask what the color of paint that you used and brand? And does it have a purple cast to it at all? 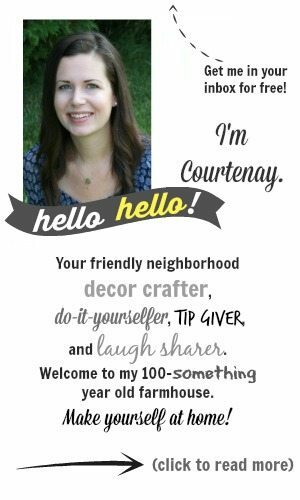 Absolutely stunning Courtenay! Love, love love!!! 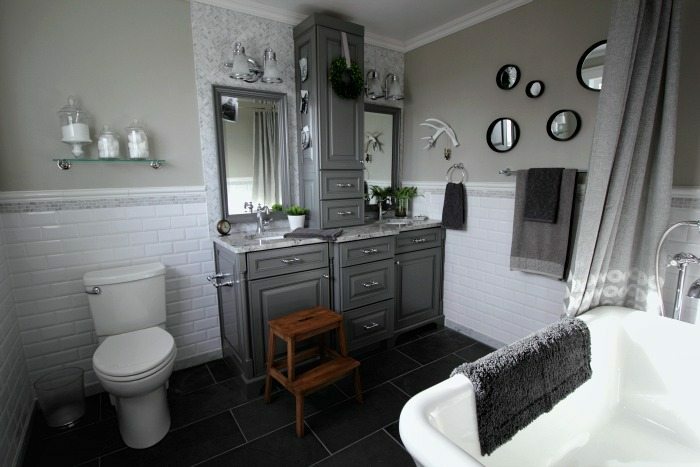 What a gorgeous bathroom Reno! Love it. I really like the toilet. I’m pretty picky about toilets. And our master bath is on the next to do list. We are collecting our large items. Storing in the garage till were ready to do. Does this model have a name? Hi Barbara Ann! In all my excitement over this new toilet, I didn’t pay much attention to the name, but it’s from American Standard and I’m almost 100% sure it’s the Cadet 3 model. We just got it at Home Depot and it was pretty reasonably-priced. 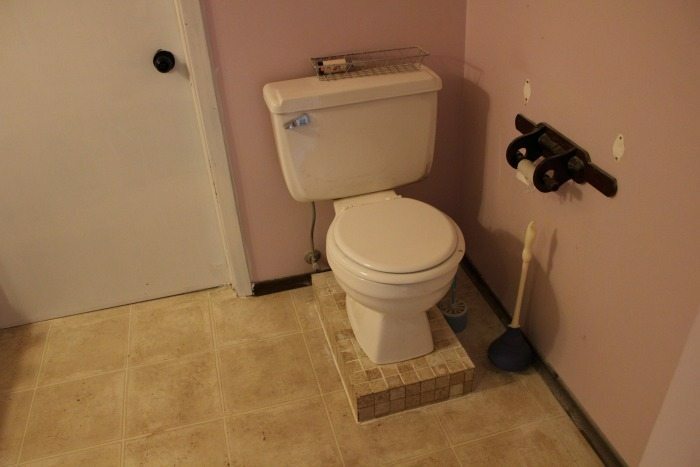 We were going to go with a fancier model from the local plumbing store, but I just really liked this one when I saw it! Hope that helps! Good luck with your reno! Hi Cyn! The wall color is the same Zeppelin that I talk about in this post here: http://creeklinehouse.com/2014/10/5-fail-paint-colours.html and the cabinet color is “Greyloft” from KraftMaid cabinets! Hope that helps! I get so many compliments on these colors so I would definitely recommend them! Hi Jen! The title came from my own brain! 🙂 Just kidding, I’m sure you meant the tile. It just came from a local tile and flooring store here. The floor tile is called Montauk Black and the wall tile is a beveled white ceramic tile, and then marble bits are just carrara marble mosaic tiles in different patterns. This is gorgeous! We ordered the same color vanity. Do you happen to have the name of the counter top you used? Where is the counter top from? I love your room, beautiful! Hi what is the size of your vanity? Please and Thank You! Hi Beverly! It’s 68″ wide and the center tower is 15″ wide. 🙂 Let me know if you’re interested in knowing any more detailed dimensions! Love the whole room! Where did you find the vanity? You bathroom looks lovely! 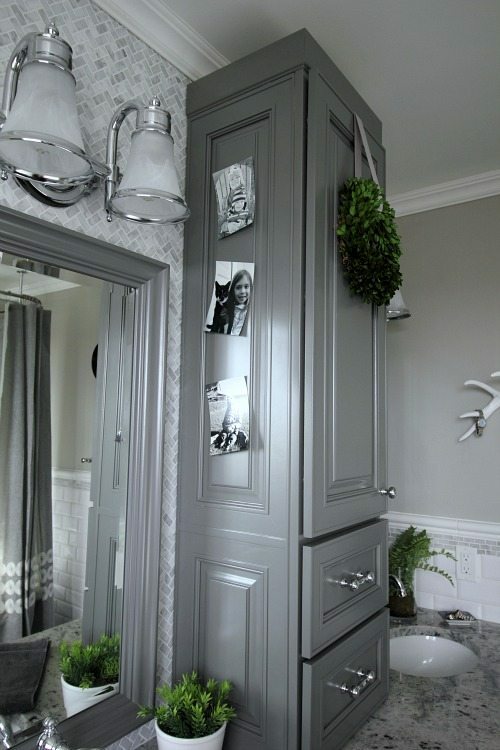 We bought Kraftmaid cabinets in grayloft for our bath as well. Can you tell me where you found the matching mirrors? Thanks! 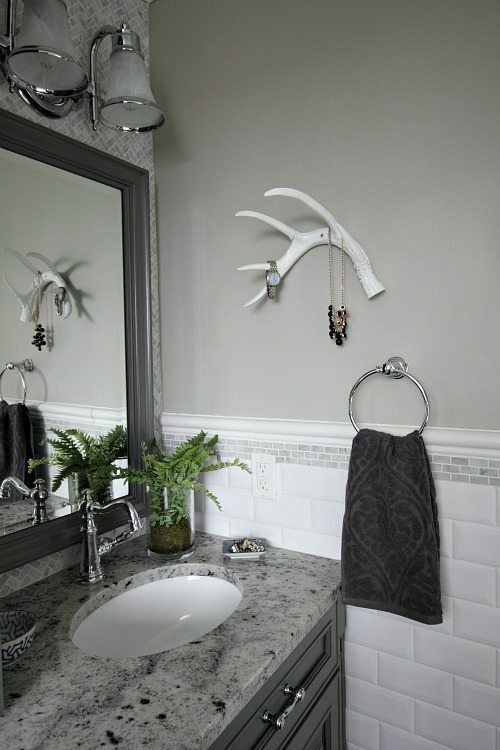 LOVE the bathroom but I have a question I haven’t seen posted.. is the deer antler a real one that you painted? How is it hung? Good question! The antler is a fake resin one and I searched high and low for it until I finally found one that would work for this! We basically just screwed a hole right in the middle of it and then used a screw to attach it to the wall. There was really no other good way of doing it that we could think of. 🙂 It’s held up really well and I can hang all kinds of jewelry, hair elastics, or whatever on it so it’s fun AND functional! I just fell in love with your bathroom. You inspired me and I almost copied you. I was going to order grey but then found a beautiful black with blue granite and decided to go with white. I’m pretty sure that you mentioned to someone that the toilet was smooth in the back instead of having all the squiggly drain pattern. Am I imagining that? Thank you for your inspiration! LOVE LOVE your design! Yes! The back of the toilet is completely smooth! 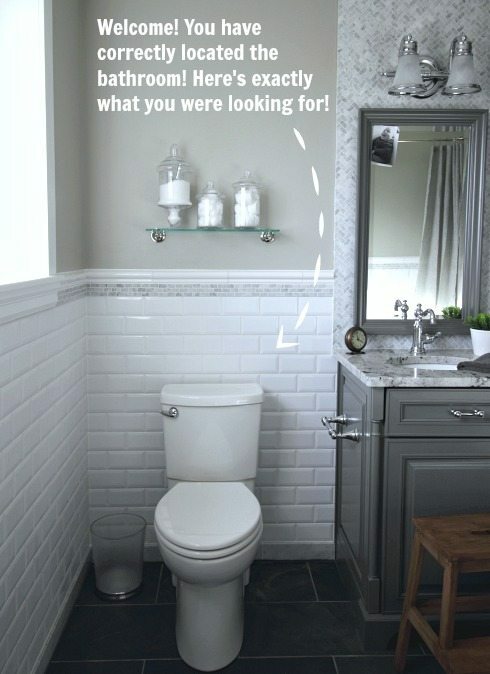 It makes such a huge difference because it doesn’t collect all the dust, fur, and junk like a regular toilet does! Thanks so much for your kind words about my bathroom design. I’m so glad you liked it! Absolutely love your bathroom. I have a question re: bathtub. Does it have a shower in it? Absolutely gorgeous! 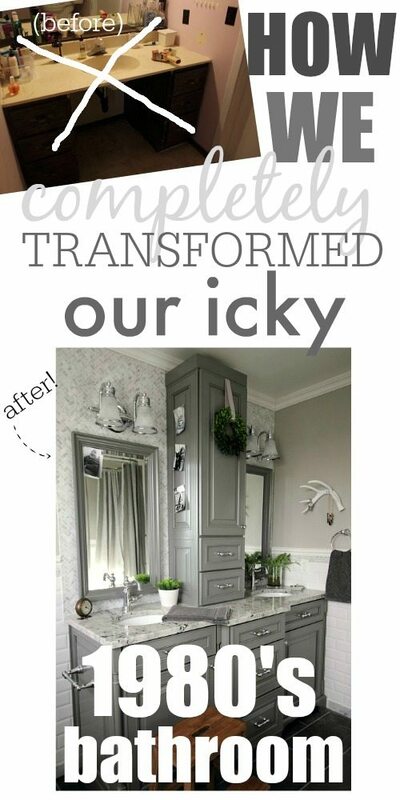 I am looking for a cabinet piece to go on my vanity to get this look myself. The tub is to die for as well. I do have one question, though. Where do you keep your shampoo, conditioner, razors, and other items you use in the shower? Beautiful! Can you tell me where the gray shower curtain came from? It looks perfect! Exactly what I was looking for to fill my 72” enclosed space. Our one sink gets awfully crowded. Two questions. Are you concerned about water seeping under the vertical cabinet and warping And/or discoloring the wood. 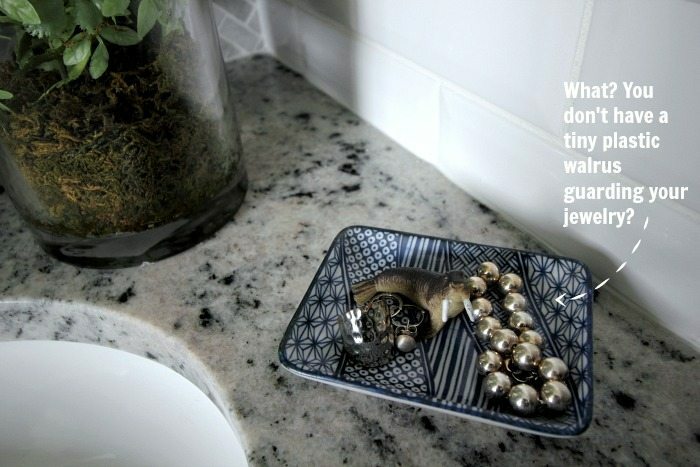 Also my wife wanted the new retanglularly shaped bowls as an integral part of the vanity top. 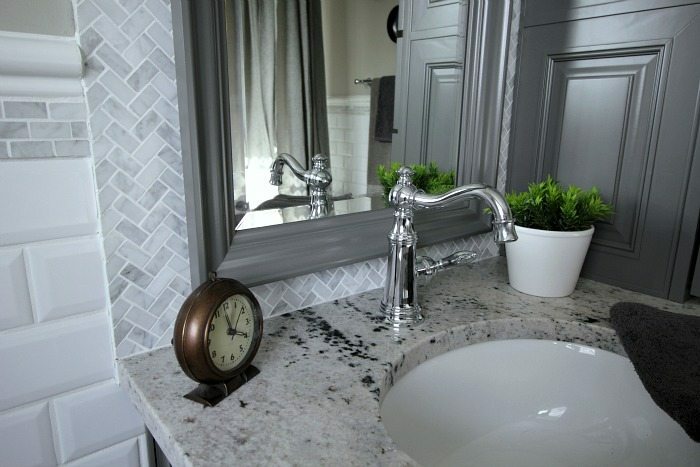 Did you encounter a source during your search for a vanity top. Hi Howard! The thought to be concerned about water seeping under the cabinet actually has never crossed my mind, but I guess it all depends on how splashy you are at the sink! I would think that a good bead of clear caulking at the base of the cabinet would be enough to keep it safe for most situations. 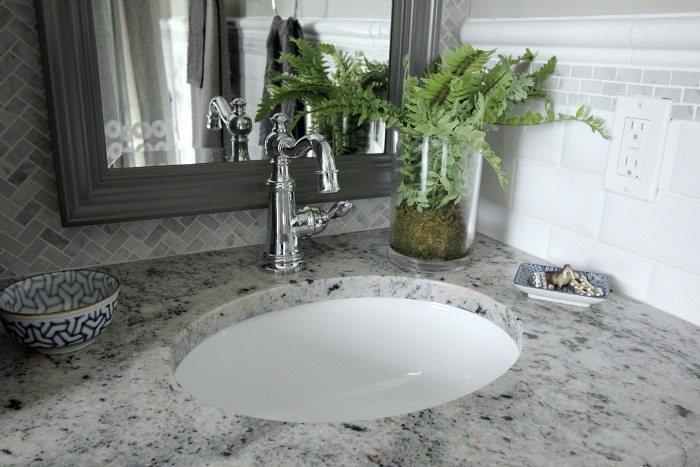 We went with the smaller round sinks just to try to maximize counter space on our small vanity, but the granite counter place did have several rectangular sink options as well. If I had a bit more space, I probably would have chosen those as well! Love it! 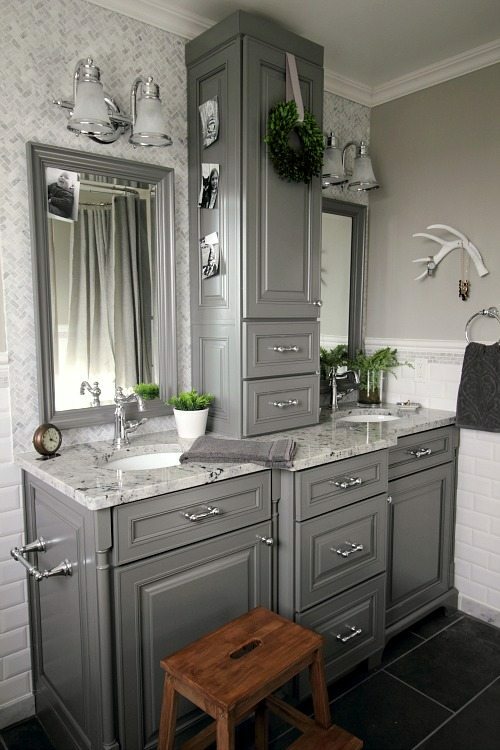 What size are the herringbone tiles above the vanity? Also, does the tub have a shower head? Hi Mary Beth! The little herringbone tiles are about 1″ by 1/2″ and they just came on 12″x12″ sheets like other mosaic tiles do. Our tub does have a shower head. We have an attachment at the top of the shower curtain where we can hook on the handheld shower piece and use it like a regular shower head!